Richard Winton of the Los Angeles Times reports that a South Los Angeles garment factory has agreed to pay backpay and overtime to settle a suit filed by the City Attorney’s office in 2009. The settlement will bring long overdue compensation for unpaid overtime to employees and will require an independent monitor at the factory to oversee compliance with workplace laws, city attorneys said. The owners agreed to pay for an independent monitor, the first time a domestic garment manufacturer has consented to do so, said Asst. City Atty Jim Colbert. The lawsuit filed in July 2009 alleged that Seventeen Inc. and its predecessor, Q&I Inc., along with their owners and operators, required employees to work 12-hour shifts, sometimes two or three shifts back-to-back, six days a week without overtime pay or rest breaks. According to the Times, the company is alleged to have falsified time and payroll records to conceal the underpayment of employees. 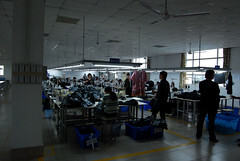 The suit also alleged hazardous and unhealthy workplace conditions, including unsanitary bathrooms without working plumbing or clean water, cockroach and rodent infestation and exposure to harmful chemicals and fine fabric dust during the production of garments.